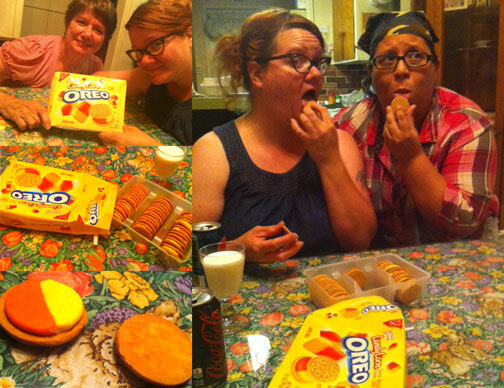 Food, Review Comments Off on Pumpkin Spice Oreo Review! Hey there horror hounds and disco cats! 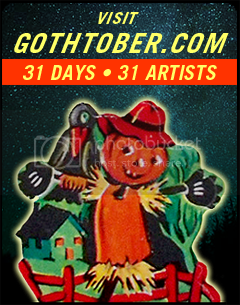 It’s that time of year again, when night prevails over day, when the most ordinary of folk transform into the macabre and morbid weirdos that we, here at Gothober, embody all year long. Autumn has descended, bringing with it the bountiful harvest of autumnal flavors and variations on the orange hue that food scientists can manage. Once inside it’s noisy yellow packaging I’m confronted with 3 rows of tawny blonde cookies on either side of deep orange filling, whose hue have echoes of both butterscotch and rust. Wafting upward is a scent that equal parts vanilla Yankee Candle and Pillsbury frosting can, along with a note of sickly sweet; not unlike that new rubber ball. I quickly, and greedily, lift the treat to my mouth! I bite down to feel a familiar Oreo texture sensation: the cookie crisp but not brittle, it’s filling yielding and unctuous. Then something new, a rush of holiday flavor! 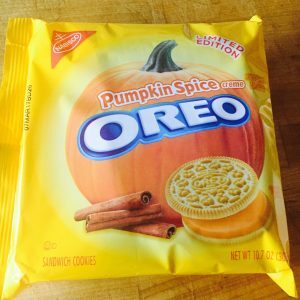 It’s flavor seems more apple cider spice than pumpkin spice. Crunching away, the flavor remains the same. There are notes of vanilla, warm and orange-y like autumnal centerpieces of nostalgia pressed into play-doh and sprinkled with golden spiced hay. The residual flav or of it lingers….lingers….lingering for much longer than one anticipates. Its feeling is of a warm gingery glow whose welcome has been thoroughly worn. All things considered. 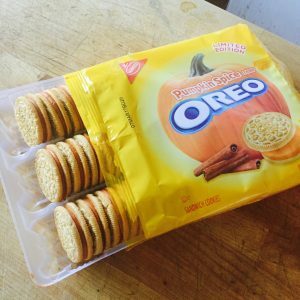 Nabisco’s holiday offering, while succeeding at the flavor of an ephemeral autumn night, loses points when it hangs around for too damn long. Something good that stays for too long. I think I feel a holiday allegory coming on. Overall: 5 disco blood bags out of 7.